Admit it. In the back of your mind, tucked between anxiety about whether your child will ace his math exam or get chosen for the tennis team, lurks something you fear, maybe most of all: Will your kid get picked on by a bully? Left out? Pushed, shoved or taunted? No one wants her child to be bullied. And few kids sail through school without living through some form of mean-kid victimization, especially in today’s cyberspace world. Maybe someone started a rumor about your daughter or posted cringeworthy shots of your son on Facebook. But here’s a jarring thought: What if it’s your child who is doing the bullying? What if your daughter is the Mean Girl who’s excluding kids from the lunch-room clique? Or your son is humiliating and bullying other boys by calling them names and shoving them around the basketball court? Bullies can be hard to spot because they’re likely to dial up the charm when around adults, experts point out. Often street-smart and socially savvy, they realize bullying others is an easy path to social status. By the time these kids are in their 20s, you’ll often find them in the juvenile justice system. “A lot of these folks end up in jail,” says Mike Donlin, a program consultant with Seattle Public Schools. Will scientists one day come up with some kind of genetic marker for bullying? Is it in our DNA? By high school, power plays emerge when students marginalize other kids they find less desirable, leaving them on the fringe of social activities. “As kids get older, the behavior goes from obvious and typical to subtle and manipulative,” Donlin says. Let’s say your kid is one of those super-socially adept kids who have you — and the grown-ups around you — successfully seduced. Everyone (you, especially) sees this child as a charismatic leader. Then one day you get a call from school. It turns out your child has been bullying other kids. “The most important thing to do is stay calm,” says Normand. “Really listen to what the teachers are telling you, and don’t get defensive.” Then begin working with the teacher, administrators and counselors to find out what’s going on. If you see a pattern like this beginning to emerge, take action. If you overhear your daughter chatting away on the telephone, spreading nasty rumors and gossiping about a classmate, take away phone privileges. “Tell your child, ‘If you’re not able to manage yourself, my job as a parent is to step in and manage things for you,’” suggests Normand. Linda Morgan, ParentMap’s associate editor, writes frequently on education issues. She (or he) is aggressive, even toward adults. She likes pushing around and teasing other children. She is a smooth talker in tough situations. Create a home environment of tolerance, where differences are celebrated and everyone feels valued. Encourage your school to develop policies and procedures regarding bullying. Ask for a bullying prevention program to be implemented in your school. Intervene every time you witness bullying behavior. If your child bullies others, provide predictable, consistent, matter-of-fact consequences. Support the child who is bullied. 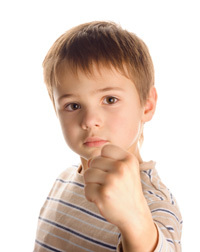 Work with the school to provide your child with effective protection against retaliation. Encourage bystanders to speak out against bullying behavior and to report it to adults. Spend time with your child. All children need a daily, personal connection with parents, teachers and other caring adults. The Health Resources and Services Administration (HRSA) produces this website, which gives students information, tips and games on bullying prevention; it also includes resources for parents. This site offers ideas and resources that help teens, teachers, parents and community members create environments that value diversity and support anti-bias activism.